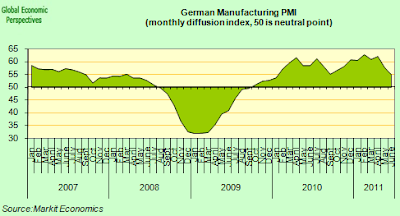 The June Flash PMI reports, which were out on Thursday, make do not make agreeable reading, in the sense that while the French and German economies both continued to expand during the month, their rate of expansion, and in particular in the leading manufacturing sector, seems to have dropped sharply, and for the second month running. 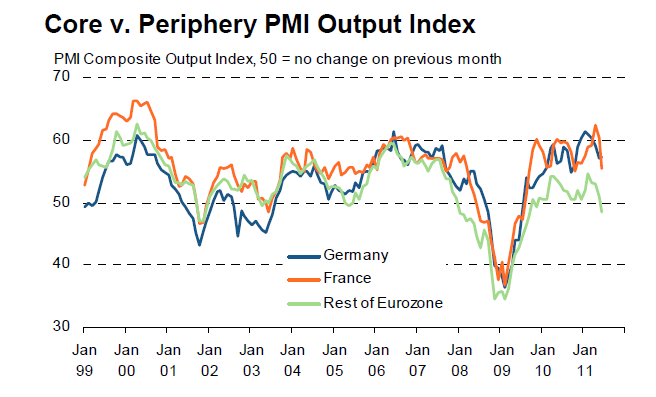 In contrast, the economies on the Eurozone periphery moved closed to outright contraction. All in all the survey results only add to concerns about the global recovery which came into focus after the May PMI results (see my To QE3 or Not to QE3). At this point detailed information is only available for the French and German economies, but there is little doubt that the pace of the slowdown in the core will mean that the peripheral economies are about to experience a double dip (and particularly worrying in this sense is the way Italian growth has been drifting downwards) and may well fall back into recesssion (in those cases where they have not already done so). Outside of France and Germany, manufacturing output (the PMIs are composite diffusion indexes, and the headline reading measures the aggregate of various components of which output levels are only one) fell for the first time since November 2009, with the rate of decline being the fastest since September 2009. So this is nothing to be sneezed at! As can be seen from the chart below, in all cases indicator readings are falling, but in the periphery case they are falling into recession territory. 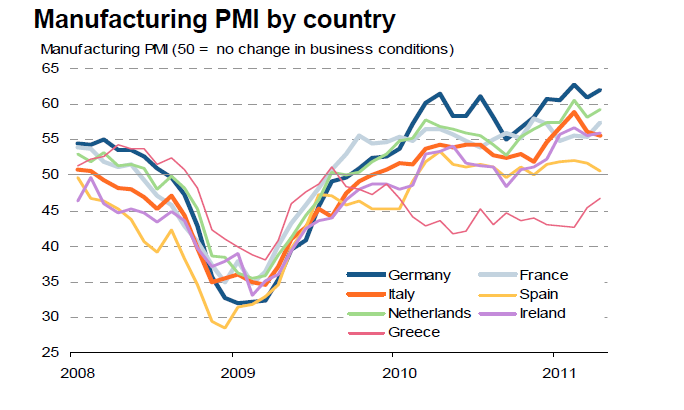 Most importantly, we should note that it is the manufacturing sector which is falling most sharply, and in an export driven recovery this has to be THE leading indicator for Europe's economies. In addition export order growth is now at its lowest level in the nine months. New business rose at the weakest rate since November 2009, led by the first (albeit small) decline in manufacturing new orders since July 2009 (see chart below). New export orders for manufactured goods rose only modestly, posting the smallest increase since September 2009. This impression of slowing global demand for exports was also confirmed by the Chinese manufacturing PMI flash reading which showed that Chinese export orders actually declined during the month (China is the only country beyond the Eurozone to do a flash PMI, and Chinese manufacturing as a whole barely expanded). These manufacturing export indicators are important, as they constitute what could be called long leading indicators (and here's ECRI's Managing Director Lakshman Achuthan explaining on Fox TV what long leading indicators are, why this slowdown isn't simply about Japan supply chains, or the weather, and why what we are facing - barring recourse to QE3 - looks like something more than a "global soft patch"). What we should be looking at here isn't the composite (red) line, but the sub components, and the one to get your head round is the business expectations component (yellow line). This peaked in February, after moving sideways from November 2010, and there is no sign of it turning up again. This is the sort of thing Lacksman Akerman talks about in his interview. 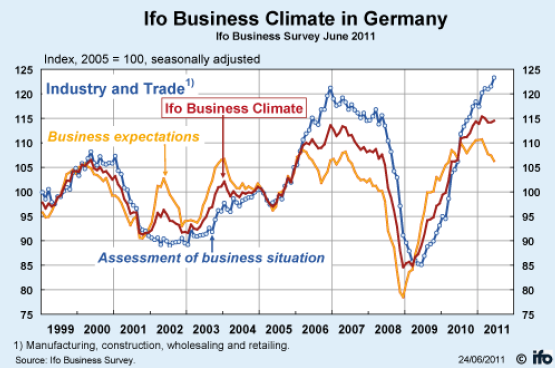 If we want to argue that what is happening is just a "soft patch" then we need to see indicators like the expectations component of the IFO to start turning upwards again, and at present there is no sign of that, so at present we lack grounds for asserting the "soft patch" argument, and in this context the fact that conditions in June were better than expected is neither here nor there, since that only tells us June was a batter month than expected, but virtually nothing about the future. 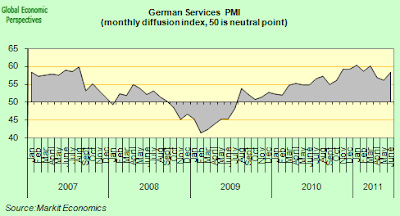 If we look at the German services PMI we can get some clues as to why the IFO overall business climate reading came in above expectations (up at 114.5 from 114.2 in May, while consensus expected a fall to 113.4): the expansion in services activity accelerated during the month, following a loss of momentum in the two previous months. In contrast manufacturing activity fell sharply. 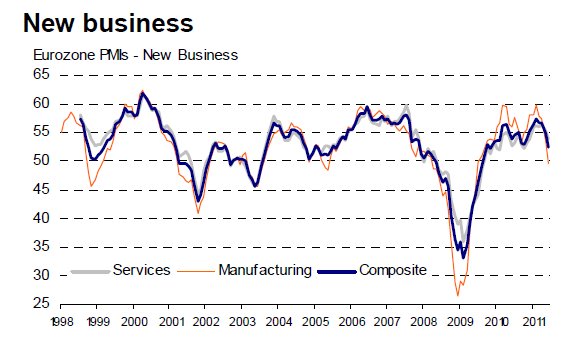 "Sector-specific data nonetheless highlighted a marked divergence between manufacturing and services in June. While services business activity increased at a robust and accelerated pace, the latest rise in manufacturing output was the slowest since September 2010. 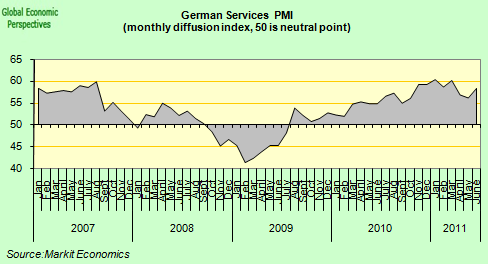 Consequently, an improved performance from the service sector boosted the overall figures for the German private sector in June. The moderation in manufacturing production growth coincided with another sharp slowdown in new order gains. 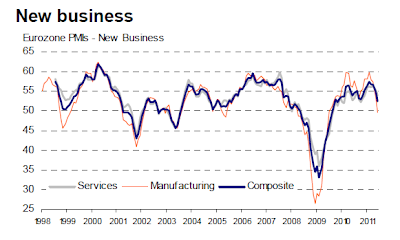 June data pointed to the weakest expansion of new business in the sector since July 2009. Manufacturers also indicated the least marked rise in new export orders since the current period of growth began in October 2009". Yep, the slowest rise in new export orders since July 2009. Now there's another long leading indicator for you, and it is showing red. If German export orders don't grow then finally the German economy doesn't grow, since Germany is an export driven economy, whatever those who live in eternal hope of a recovery in German domestic consumption may tell you. 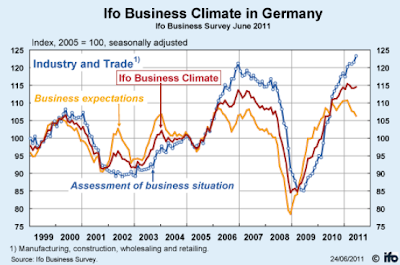 Now if we go back to the IFO chart for a moment, note that the assessment of the current business situation hasn't peaked yet, although it must surely be close to doing so. The last time this component in the indicator peaked was at the end of 2006, and guess what else coincided with that peak? The cyclical wave of the last German GDP expansion (in terms of year-on-year growth) peaked at (more or less) exactly the same time. 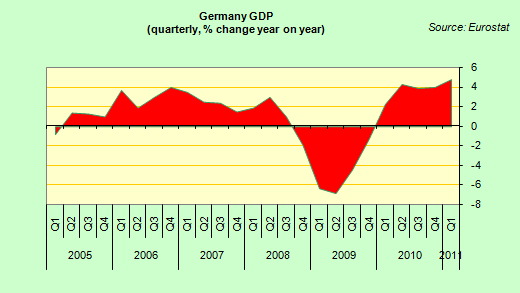 Now obviously Germany didn't go on to enter recession for over a year (5 quarters to be exact), which means we probably aren't talking about a recssionary slowdown in Germany at this point, but what we may be talking about is a German economy which is passing its cyclical high point (shudders go out along the periphery on reading this, since the peripheral economies haven't even gotten their recoveries seriously started yet), and if this is the case there will be clear implications for Eurozone momentum. 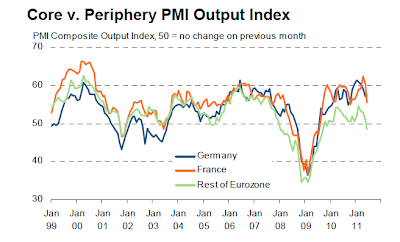 As I say, we have no flash PMI's for the periphery, but if we look at the May reading, it is clear that while Greece is in a world of contraction all of its its own, Italy and Spain have been steadily weakening, and it is quite possible they both countries will register contraction this month (Ireland has somehow escaped the trend up to this point). 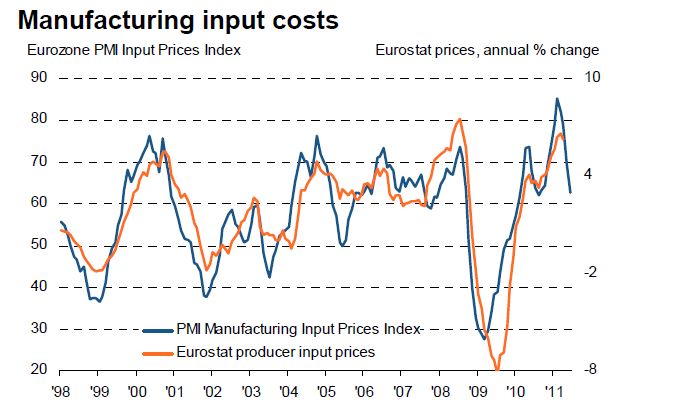 â€œThe euro areaâ€™s economic growth surge has lost momentum at a worrying rate in the past two months. While the average PMI reading for the second quarter as a whole suggests that the economy grew by around 0.6%, down from 0.8% in the first quarter, the reading for June was consistent with a quarterly growth run rate of just 0.4%. Manufacturing growth has slowed especially sharply, slipping close to stagnation in June. Even German manufacturing, the driving force of the regionâ€™s recovery, has seen a marked deterioration in output and new orders growth â€“ linked to a large extent to a severe weakening of export order book growth. 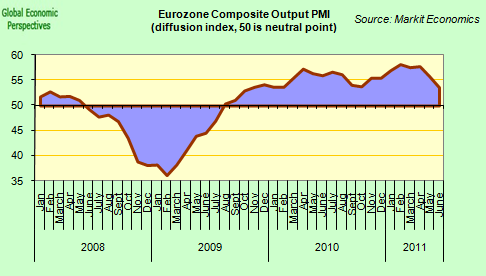 Meanwhile, the euro area excluding France and Germany has fallen back into contraction for the first time since late-2009". Curiously, just this week Goldman Sachs European Department have published (European Weekly Analyst June 16) a new set of leading (not long leading) indexes (attempting to identify trends for the three months ahead), and their findings broadly corroborate the PMI outlook. What is especially noteworthy in their list is the very weak showing from Italy (see my Is Italy Not Spain The Real Elephant In The Euro Room? for background). Italy and Spain languish. As expressed in our latest views published on Italy (see EWA 11/18) and Spain (see our European Views â€œSpain: Mitigating concerns about regional deficits, but mixed views on short-term growth prospectsâ€, June 6, 2011), Italy and Spain may lack momentum in the quarters ahead, as suggested by the quasi-flat EURO-LIs in May. To Raise Or Not To Raise In July? Which brings us to the ECB, and the potential policy implications of these results. The first thing to note is that the flash PMIs suggested that inflation continued to ease back in June, particularly in the leading manufacturing sector. As the accompanying report states, "the easing in output price inflation in manufacturing was driven by a further steep easing in input price inflation from the survey-record rate of increase seen in February. A ten-month low in the rate of manufacturing input price inflation was accompanied by a five-month low in the service sector. 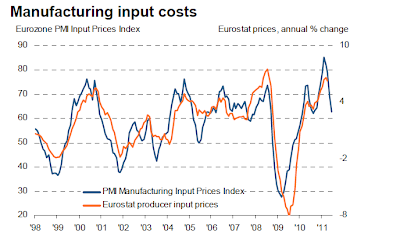 Measured across both sectors, input costs rose at the slowest rate since October, down sharply from Marchâ€™s peak". I don't know if that is clear enough for decision makers over at the ECB yet, but supply side inflation is definitely on the wane at this point, and since economic activity is also weakening this environment is hardly supportive of a rate rise decision. Which really raises the question as to whether the ECB will proceed with its already pre-announced interest rate rise in July. I for one now have serious doubts. The only real justification for raising would seem to be that Monsieur Trichet used the expression "strong vigilance" at the last post meeting press conference, and it may be that they now feel bound by their word (for the avoidance of uncertainty), foolish as this approach may seem to everyone else. Really, if it is doubt in the markets you want to avoid then they may as well have raised rates in May, but then I suppose someone will add that they don't like giving the market surprises. The rejoinder to this might be that showing a little flexibility now and then might not be a bad idea either. Really, the issue is not whether or not the ECB would be right to go ahead with a further rate rise in this situation - personally I think it is pretty obvious they wouldn't as I made plain from the start in my Chronicle of a Policy Error Foretold post on the CNBC blog before this charade even got started. The issue is whether the Governing Council of the ECB will prove themselves flexible enough to change discourse in the face not just of Greek default woes, but of slowing inflation and growing recessionary risks? In other words, are ECB decision makers moved more by developments in the real economy, or by an obsession with trying to "normalise" interest rates as quickly as possible using the happy circumstance of temporarily above target inflation as the excuse (however much M. Trichet denies they have this kind of agenda)? In fact he even has the justification that - as he said himself on Friday - that the risk signals for financial stability in the euro area are "flashing red". Surely, at this critical moment in the history of the common currency he has stewardship over, he would not want to go down in history as the Montagu Norman of the Great Global Recession. But then, maybe I am being unfair. Possibly it is another ghost that is keeping Monsieur Trichet thrashing around on his pillow at night: the one formed by the precedent of the Bank of Japan in 2007, who when they found themselves forced to call a rapid halt to a previously much paraded rate hike programme after only one measly 0.25% rise. History, as they say, does repeat itself, even the ECB's own recent history, but let us hope that this time we will not have to face an example of "once bitten, twice shy". Nine Reasons Why Spain's Economy Is More Different Than You Think! Spain, as those 1990s tourist brochures used to tell us, is different. And it certainly shouldn't be confused with Greece. Even a cursory look at the most basic of maps should satisfy any doubts we might be harbouring in that regard. But being different is not the same thing as being economically sound. Which is what Societe Generale's Klaus Baader has just tried to argue in a recent research note: "The Spanish bond market was hit hard in the wake of the quantum leap in the Greece crisis. 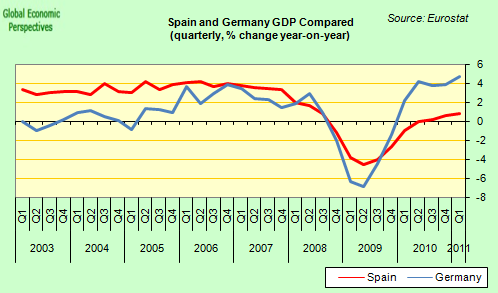 But fundamentally the case for Spain remains strong". In singling out the nine points that Klaus advances in support of his thesis for detailed examination, I do not do so because I find the arguments particulary bad (or even especially "noteworthy" in the negative sense). He has a point of view, and he is doingh is job, and in neither case can I fault him for this. The reason I have decided to single Klaus out for special treatment here is because he conveniently brings together, in a clear and succinct fashion, a number of arguments which are widely accepted and used by both analysts and policy makers. Unfortunately the fact that arguments are widely held does not make them valid, or in anything other than the most trivial conventialist sense "true". Indeed it is precisely because I feel that these arguments are not well founded that I have decided to reply to them in this rather detailed way. 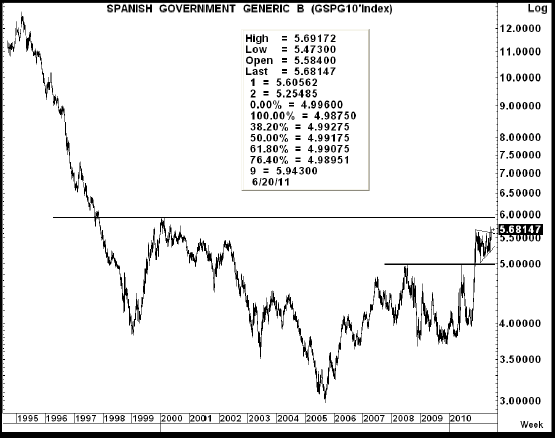 Basically I don't buy the idea that Spain is simply suffering from a crisis of confidence, one which, in its turn, puts pressure on the government bond spread. 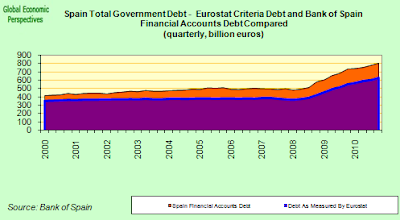 I think Spain has a problem in the fundamentals department, and unless this problem is first accepted and then addressed the wrong (inadequate) remedies will continue to be applied, putting the Eurozone and its citizens at risk of financial catastrophe in the medium term. 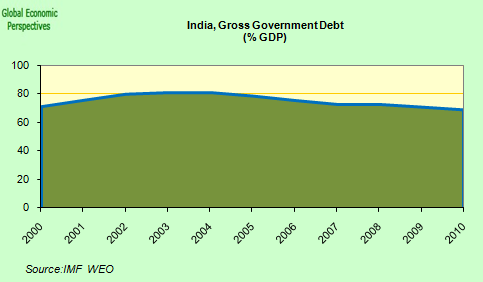 Argument Number One: - Public sector debt is low and will stay low. "Spain’s public sector debt ratio of 60.1% in 2010 is nearly one third below the euro area average. Excluding potential bank bailout costs, but also privatisation receipts, debt is expected to peak at less than 70%". Not so! Or rather not necessarily so, since the beauty, here as always, is in the details. 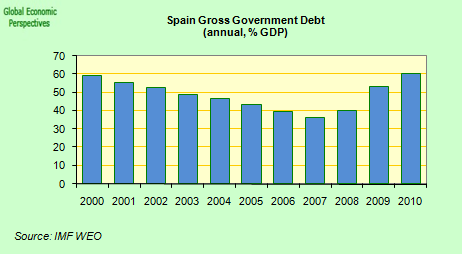 Certainly Spain's public debt to GDP ratio is low by European Union standards, and significantly below the EU average. But it is not the case that it is universally expected to peak below 70%. In fact the IMF (to name but one) expect Spanish government debt to GDP to hit 72.1% of GDP in 2014, rise to 74.13% in 2015, and stand at 75.94% in 2016 (according to their April 2011 World Economic Outlook forecast). 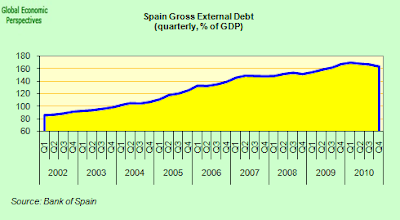 In fact, we don't yet know where Spain's debt to GDP will peak, or when, since there are too many unknowns in the equation to reach a definitive conclusion, all we do know for sure is that it continues to rise, indeed according to Bank of Spain data released last Friday, by the end of the first quarter of 2011 Spain's gross debt was up again, and stood at 63.6% of GDP. There are many factors that could condition the size of the debt to GDP ratio, the unpaid bills on regional government books (93.6 billion euros at the end of Q4 2010), the 83 billion euros given by the government in guarantees (or 7.8% of GDP, a quantity which will only be turned into debt should the guarantees need to be honoured), the debt which is languishing on the books of public sector companies (55.7 billion euros at the end of Q4 2010), the possibility that the Spanish economy have a bout of deflation at some point, etc. But all of these are, when all is said and done, comparatively small beer, and would simply imply, for example, under a worst case scenario that Spain's debt to GDP might peak around 95% of GDP as opposed to the IMF's 75%+ calculation, high, but not unmanageable, provided the economy returned to growth. But, as the Societe Generale commentary suggests, by far the largest downside risk in the whole picture is the size of any potential bank bailout costs. Here we are almost totally in the dark, since we know the minimum (the cost of the current FROB restructuring) but we have no real idea of the maximum, a point which was brought home recently by Barclay's Bob Diamond when he visited Spain's Prime Minister Jose Luis Rodrigo Zapatero in the Moncloa to discuss the possibility Barclay's might buy the troubled Caja de Ahorros del Mediterráneo. Most observers have little doubt that Barclay's interest was real, but the stumbling block was not the price: Bob Diamond wanted Prime Minister Zapatero to give guarantees over the potential downside for the bank assets, and of course he couldn't. I am sure Mr Zapatero has no better idea what these are than I do. 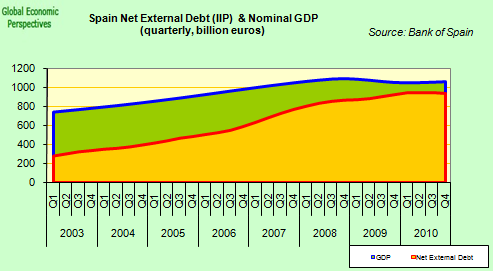 What we do know is that without being able to arrive at a conclusion on this topic, all the current debt to GDP numbers floating about don't have a lot of importance, since we can all remember only too well how Ireland's debt to GDP shot up from 25% of GDP in 2007 to an anticipated 114% in 2011. So if this risk wasn't real and a concern to market participants, then it would be hard to understand why the Spanish 10 year bond spread is currently hovering around 270 basis points over the yield on the equivalent German bund. German gross government debt is currently in the region of 80% of GDP, or some 15 percentage points above the Spanish level. So without the presence of this perceived risk market pricing would be inexplicable (which, in fairness, to Spain's economy minister Elena Salgado, she probably thinks it is). Argument Number Two - Public sector deficit reduction is on track. "Unlike Greece, Ireland and Portugal, the fiscal consolidation targets have been reached in 2010 and are on track in 2011, even allowing for some deficit overshoots in some of the Autonomous Regions. That means that the 3% benchmark level stands every chance of being met by 2014". This argument, notwithstanding that this is the issue which most seems to have been worrying investors of late, may well be more or less valid. Spain's government has made great efforts to comply with what they perceive to have been investor concerns since the "about turn" in May 2010, and it is reasonable to assume that these efforts will continue, and that despite some first quarter slippage, the fiscal deficit may well come in this year at or around 6% of GDP. Issues: the fact that public spending (and debt) increased significantly faster than they should have done in the first three months of the year (even making a positive contribution to the first quarter growth number), means that the cut backs in the second half of the year will need to be greater than anticipated (especially if growth is nearer to the Bank of Spain and IMF 0.8% estimate than to the Spanish administration's 1.3%) and these additional cuts will, of course, also further negatively impact GDP growth. In addition there has been the recent rise of the "indignados" protest movement. With this movement gaining strength (as we have also recently seen in Greece) and becoming increasingly openly opposed to the Brussels inspired stability programme, the government's margin for manoeuvre may become increasingly restricted, and especially if unemployment continues to rise and Spain drifts back towards recession. This movement is a new factor on the Spanish scene, and its presence needs to be taken very seriously. Argument Three - The banking sector problems are manageable. "There is no doubt that the Spanish banking sector, particularly the savings banks (cajas), has problems. But even the most apocalyptic predictions of potential losses amount to some €200bn, which is 20% of GDP. Our analysis suggests that this would lead to a new capital requirement of some €60-70bn, equivalent to 6% of GDP". This argument is obviously one of the most tendentious of value judgements. What is manageable here, and what isn't? Where do we begin in this minefield? To know the true level of losses to which the banking system is exposed we would need to know a number of things we evidently don't know and are possibly in principle incapable of knowing with any exactitude until the Spanish economic drama unfolds further. This is effectively the reason why Spain's Prime Minister José Luis Rodriguez Zapatero couldn't give Barclay's CEO Bob Diamond the guarantees he was looking for on his visit to the Moncloa to talk about buying the Caja de Ahorros Mediteraneo. Mr Zapatero couldn't help him, since he didn't know either. 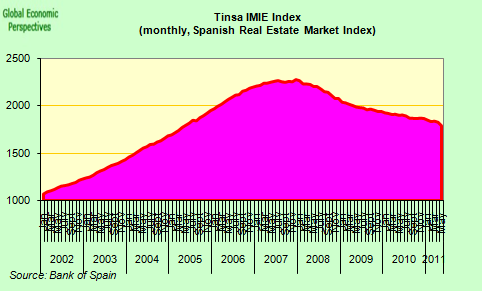 To be able to adequately answer the question we would need to know how far, and during how long Spanish property prices were likely to fall. Really this is a question to which no one has a real answer. Certainly we know that the index maintained by property valuers TINSA fell at an interannual rate of 5.88% in May, the fastest drop since December 2009, and that the market is showing all the signs of having a double dip, especially taking into account that total house sales hit a post crisis low of 24,100 in April, while new home sales fell to 11,500. In fact house prices on the TINSA reckoning have now fallen 21.5% since their December 2007 peak, and we have no real clear idea of how much further they have to fall. We would also need to know the level at which Spain's unemployment were going to peak, and how long it will need to get back down to single digit levels. This is becuase one of the key factors which will also have a sure and certain impact on the level of bank loses is the level of unemployment, since it will influence mortgage default rates, and also serves as a proxy for many other economic indicators which also affect bank profitability. Monthly labour office signings fell back in April and May, due to the impact of seasonal industries like tourism and agriculture, but the seasonally adjusted figure continues to rise, and stood at 20.7% in April according to Eurostat data. 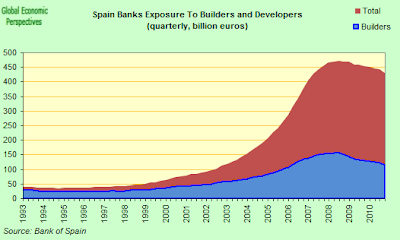 One think we do know is that Spain's banks still don't have normal access to the interbank market. Thus confidence among other bankers (as opposed to among politicians and policy makers, or what bankers themselves say in public) is not as high as it could be that these problems are easily manageble. 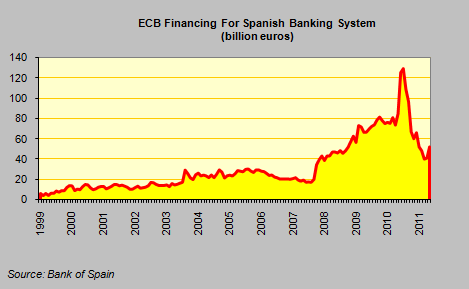 In addition, every time risk aversion rises in the Eurozone pressure on Spanish banks mounts, and it is not insignificant that they have been going back to the ECB in increasing numbers since April this year. Argument Number Four - The current account is under control. 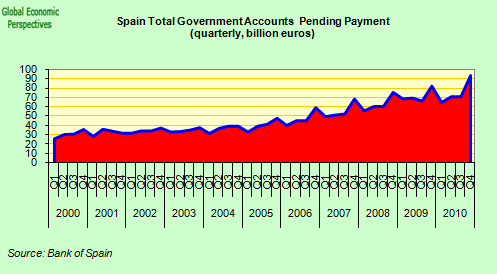 “Spain had a current account problem in 2004-2009, with a shortfall that peaked at 10% of GDP in 2007. But by 2010, the shortfall had fallen to 4.5%, and a further decline is likely as domestic demand remains weak at least until the end of 2012, and export competitiveness improves, both in manufacturing and in services/tourism”. 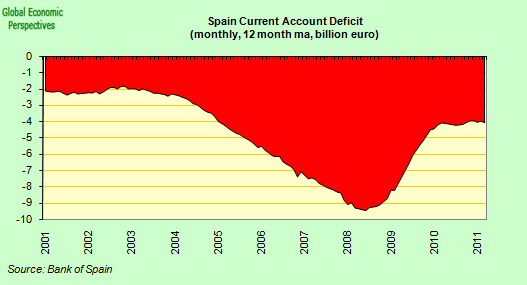 Unfortunately, the Spanish current account is NOT under control. 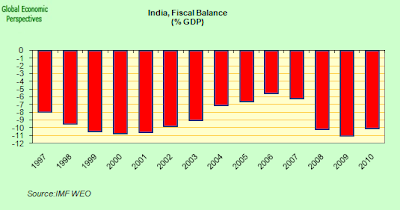 The twelve month trailing deficit has reduced by around 60% from the 2008 high point, but has been stationary at around 4% of GDP for over a year now. Two factors have accounted for this sharp drop, a fall in imports and a reduction in interest servicing costs on the external debt. Exports have returned more or less to their pre crisis high (see below), while imports dropped sharply and have not recovered their earlier level, so one part of the CA deficit improvement is due to lower consumption and lower living standards, a change which due to the way GDP is calculated (only net trade counts) is actually GDP positive, but try telling that to the “indignados” protesters. The only politically sustainable way to carry out this sort of transformation over time is via a sharp increase in the historic trend level of exports. But it is the second component in the current account improvement which most analysts miss, and that is the change in the income account (see chart below). The 12 month trailing income account balance has improved by roughly 40% since early 2009. 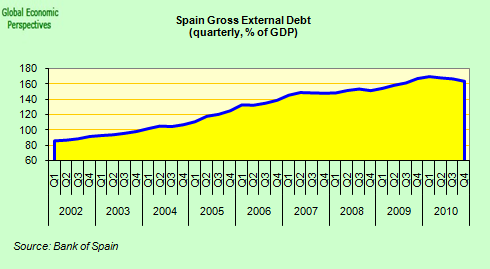 The reason for this is not an improvement in Spain’s external indebtedness position (see below), since logically with an ongoing current account deficit the external position continues to deteriorate, but a decline in corporate profitability associated with the crisis, and a drop in interest servicing costs on the debt as interest rates have fallen to historic lows. The important point to grasp here is that both of these components are CYCLICAL and not STRUCTURAL. That is to say, if interest rates were to rise again to previous levels (normalise) ECB, and corporate profitability recover then the income account would automatically once more deteriorate. The good news is that this is unlikely to happen, but the bad news is that this is unlikely to happen since the Spanish economy is unlikely to recover, and the ongoing weakness in the peripheral economies (including Italy) means that the ECB is unlikely to be able to go very much further with its rate normalising policy. The real problem is the country risk element. 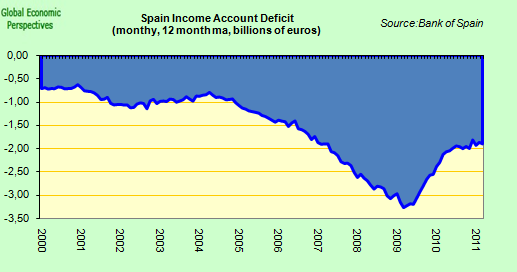 As the spread on Spanish sovereign debt and bank debt rises the income account will evidently deteriorate, and this is obviously one of the major risks for the Spanish economy at this point. The more country risk rises, and the more the weight of interest payments pressurises the current account the more living standards internally need to be compressed (via austerity measures) simply to keep the country afloat. Clearly at some point or another this hits political viability limits. 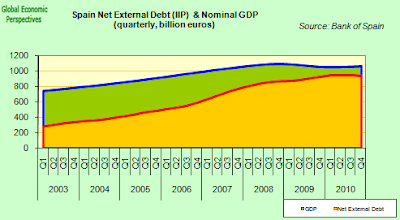 Also, it should be noted that while net external debt is around 90% of GDP (very problematic in and of itself), gross debt is roughly double that, and if Spain country risk (and hence the cost of financing) rises, while country risk (and hence interest rates) in key emerging markets (from a Spanish point of view) continues to fall, then the structural income balance can even deteriorate, as well as the cyclical balance. Argument Number Five - Competitiveness is not as bad as many think and improving. 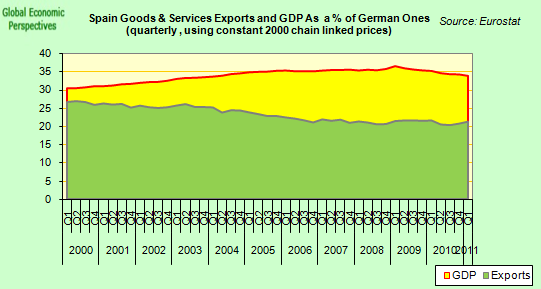 "One, Germany is not the benchmark – it was clearly not competitive in 2000, owing to unification in particular. The gap to the euro area aggregate for example is less than 10%. 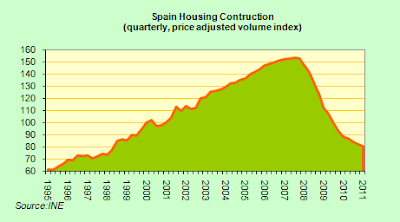 Two, Spanish ULC were in part driven higher by ULCs in the construction sector, which has little bearing on export competitiveness. 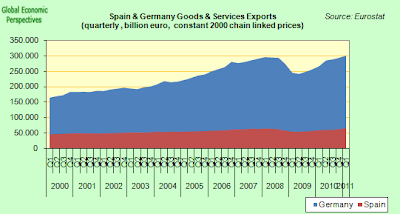 In any case, if Spain has really lost so much competitiveness it would be unlikely to export as successfully as it does: from 2005 to 2010 (annual data, nominal), Spanish exports rose every bit as much as German exports (21.0% versus 20.9%). And Spanish labor is cheap: according to Eurostat data, wage levels in Spain are 25% below the euro area average". This issue is basically the nub of the question. If Spain's economy is not fundamentally uncompetitive then it should gradually return to sustainable growth, given enough time and a few labour and product market reforms. But if it is as uncompetitive as I, and other macroeconomists, argue (needing a price adjustment with Germany of around 20%), then not only will the growth not return, sovereign debt default 5 or 6 years down the road could become a growing possibility as the banking system creaks and strains under the weight of accumulated debt and non performing loans. 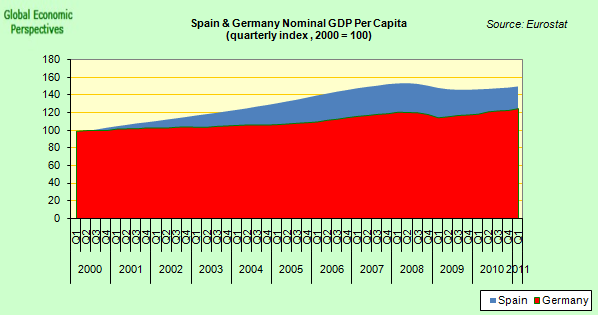 If Germany is not the benchmark for Spain, then it is hard to know who is. 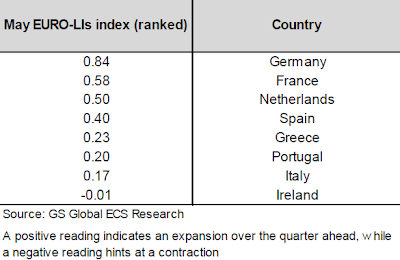 Evidently it should not be Italy, or any of the other low growth peripheral economies, since being as uncompetitive as they are is hardly going to help see Spain through. Perhaps France is the benchmark? But then France has a deteriorating current account position, so even France may not be a good role model for Spain, especially since the French private sector is not heaviliy indebted in the way the Spanish one is, and hence the economy is still laregly driven by domestic consumer demand, something which is now impossible in Spain - at least while the deleveraging process is taking place. 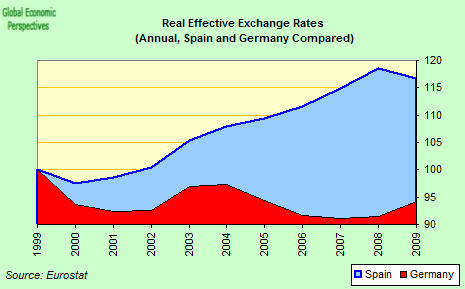 So here is the nub of the matter, and the key problem that those who tend to dismiss the macroeconomic arguments need to try to follow, since this isn't a game to see who is right and who is wrong, it is about saving the Spanish economy, and with it (if possible) the euro: THE SPANISH ECONOMY IS NOW TOTALLY EXPORT DEPENDENT FOR GROWTH. This is why macroeconomists tend to use the German economy as a benchmark, since the German economy has successfully become an export driven one, and Spain needs to follow in Germany's footsteps. 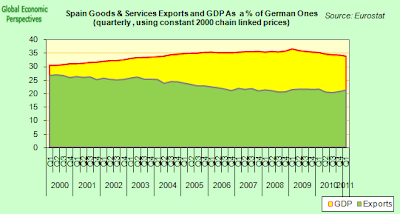 Evidently, as Klaus Baader tells us, the German economy was far from competitive in 2000, which why the German economy had to go through a hard and painful restructuring process to gain the competitiveness it needed to generate the level of exports it needed to improve the growth performance. Now Spain needs to follow in Germany's footsteps, and I don't see the point in trying to deny this. Spain is now an export dependent economy due to both debt overhang issues and due to the economic impacts of population ageing. Spain is not returning to the pre crisis world it knew, because Spain is already too much in debt to be able to drive growth by generating even more debt, and because Spain's median age is rising in a way which is going to change the pattern of national saving and borrowing. And there is a third and "last nail in the coffin for the old way of life" kind of argument that is important here, and that is the Spanish are about to realise what either Franco Modigliano or Milton Friedman could have explained to them decades ago, and that is that a house is a place to live in, that is to say a consumption good, and is not part of some fancy new asset class of investment good which you can use to get rich easily, and speculate with. 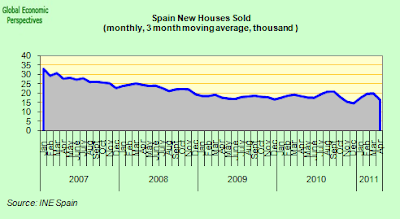 77% of the total stock of Spanish savings is invested in property, and around 85% of the Spanish population own one or more homes, which means, as the Spanish themselves are now discovering, that as property prices go down you suddenly start to get poor in just the way you formerly got rich. Indeed herein lies one of the key floors in the way Spanish policymakers tend to think about economic issues. We are now no longer living in the pre 1930s world were spending out of current income was the key indicator to understand economic growth, either credit or export surpluses drive modern growth, and where there is little credit, and insufficient exports, then there is little (or no) growth. 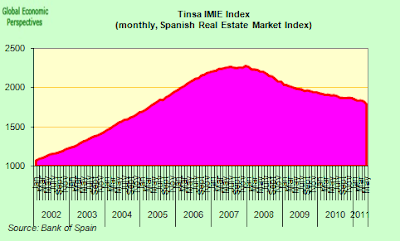 In fact, with property prices falling in a way which constantly reduces the value of their stock of savings, Spanish families may well be caught in a modern paradox of thrift whereby no matter how fast they try to save out of current income they still are in a negative net wealth dynamic as property prices fall and fall. 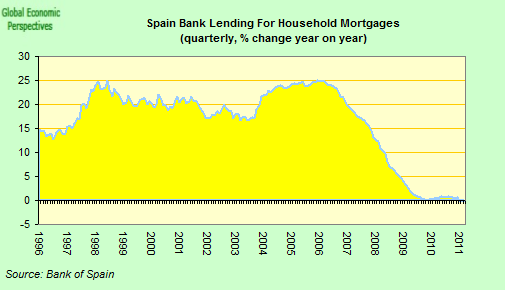 Anyone who wishes to understand why Spain's banks have not driven prices down sharply through firesales should consider carefully how this would impact on household wealth, and saving and spending patterns. 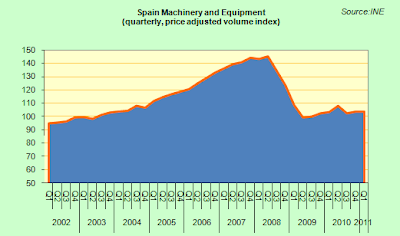 But back to the issue in hand, export dependence and Spanish competitiveness. Evidently, the first piece of evidence macroeconomists present is the comparative Reel Effective Exchange Rate data. Of course, critics of macroeconomists argue that this is almost irrelevant, but I don't see why we should shy away from presenting this data simply because some people don't like it, since in my humble opinion it certainly isn't irrelevant. 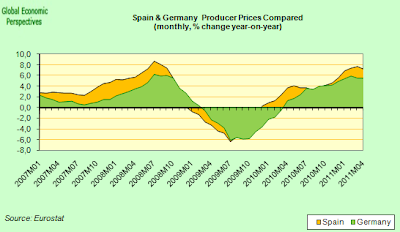 Looking at the chart below it should be obvious that Spain lost price competitiveness vis-a-vis Germany systematically from 2000 to 2008. Of course, there is another way of looking at the whole problem, and that is to look at productivity movements. 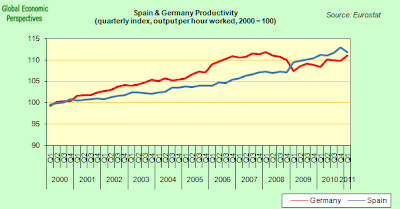 Again we can see that from the start of the century till the outbreak of the crisis, German productivity improved significantly over Spanish productivity. This situation reversed somewhat during the crisis (I will come back to this below). On the other hand, when it comes to living standards, what we find is the exact OPPOSITE, that is to say Spanish living standards improved significantly more than German ones. So in one country living standards rose, while in the other productivity rose - surely something is upside down here, isn't it. Naturally, and on aggregate, the Spanish paid themselves more than they were economically worth, and used borrowing guaranteed by their houses to do this. There is no great mystery here. 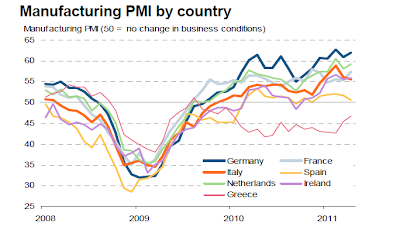 But what it does mean is that Spain LOST COMPETITIVENESS. They weren't the worst along the periphery in this sense, but that is beside the point. And it doesn't matter at all here whether Spanish wages are low or high, what matters is how much you produce in each hour you work. Something Angela Merkel learnt to her cost recently when she suggested that Spanish workers should work longer hours and take less holidays (you know, that siesta feeling), only to find that the Spanish work longer hours than the Germans. Also, I have used nominal GDP per capita (and not living standards) here, because it doesn't matter how much your earnings can buy in real terms for this calculation, becuase the fact of the matter is that the Spanish worker is paid in those very same Euros as German workers are, so the direct comparison is valid. If Spain still had pessetas all that extra inflation wouldn't have mattered so much, since the country could have devalued and made the adjustment. But it can't, it is stuck with the legacy of the past, which is why I and other macroeconomists have been advocating a simulated (internal) devaluation to bring the price and wage level down by 20%, but virtually no one has been listening, since like Klaus Baader, they don't think it is necessary. They think - along with members of the current Spanish administration that talk of Spain's loss of competitiveness is exaggerated. Another way of looking at things is via a comparison of unit labour costs. As we can see, Spain's unit labour costs rocketed when compared with Germany's during the first 8 years of this century. This is only the same thing as saying that productivity didn't rise very fast while wages did. What is interesting is that this process moderated with the onset of the crisis, and indeed Spain's unit costs fell, even as Germany's rose somewhat. Many have cheered this as an indication of a successful adjustment. But they are missing something here, and this is what is known as the compositional effect. 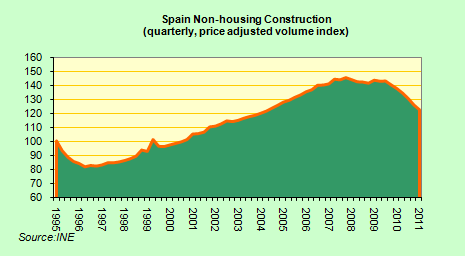 Basically Spain's economy shed nearly three million low-paid, low-productivity workers as the construction boom unwound. The result of this was that aggregate productivity ROSE, and aggregate unit costs fell - while unemployment rose from around 8% to over 20%. German employers, on the other hand, made great efforts to retain workers via the system known as Kurzarbeit, and as a result unit labour costs rose, and indeed productivity fell (remember the productivity chart). 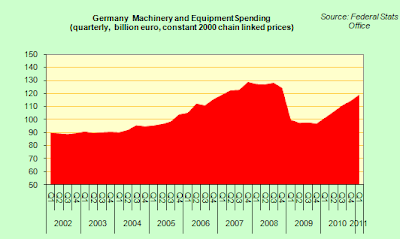 German industry sacrificed some of its competitiveness in the interest of social cohesiveness, and not inflating the government deficit, and unemployment continued to fall almost all the way through the crisis (see chart below). Naturally now the German economy is more or less back to its earlier capacity levels productivity is once more improving. Now, let's go back to the international competitiveness argument. 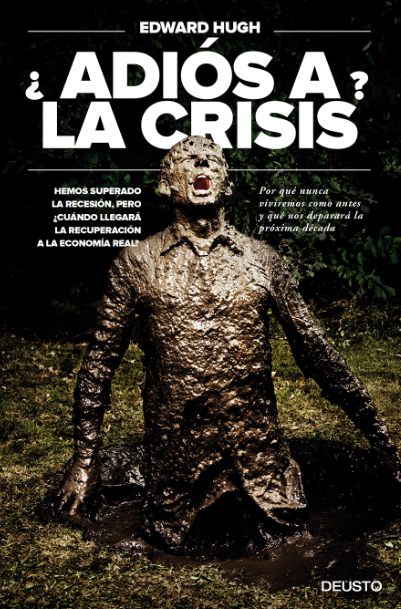 Obviously this is not the same thing as saying that each and every Spanish company (or sector) is uncompetitive, but that the economy as a whole is not sufficiently competitive, that is to say not sufficiently competitive to generate the export activity needed to return the economy to sustainable growth. There is an externally tradeable sector which is comparatively competitive, and a munch larger non tradeable sector that is completely uncompetitive. In this sense, don't look at the exports, look at the imports: Spain needs to produce domestically a lot more of what she imports, this alone would turn the trade deficit into a trade surplus, and provide employment to boot. The problem is that the sectors which produce these products have either been closed down or are not able to compete on price. Talk about the energy deficit is irrelevant here, since oil prices are what they are, and since Spain is externally dependent on energy this needs to be imported. Of course, the energy deficit can be reduced by conservation changes and alternative energy sources, but none of this alters the fact that Spain needs to produce sufficient exports to cover ALL imports, and then some more to generate a surplus to drive GDP growth. So, and summing up, the key point about Spain's export sector is not that it is not competitive, but that it is FAR TOO SMALL for the job it now has to do. 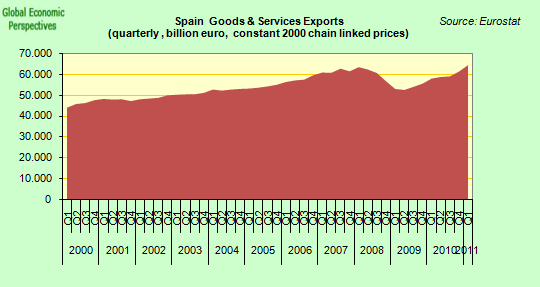 Spain's exports have returned to their pre.crisis high. As have Germany's, but just look at the relative size of the two sectors (and this chart is goods & services, so tourism is included). 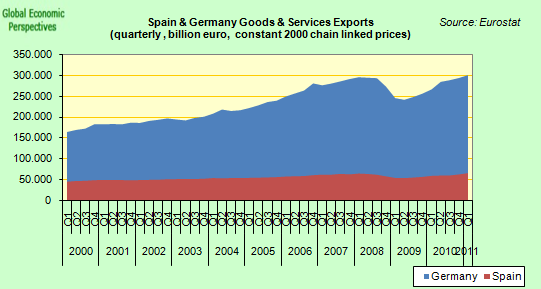 Of course, Germany's economy is a lot bigger (but not THAT much bigger), so let's look at the relative shares of Spanish GDP and exports as compared with their German equivalents. 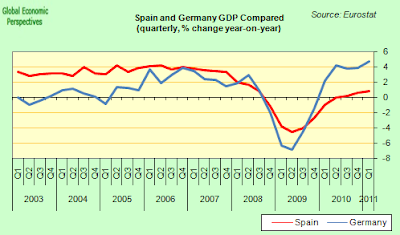 As can be seen in the chart below, Spanish GDP increase steadily as a % of German GDP in the years before the crisis (as we have seen, there was no relation between what people were being paid and productivity in Spain over these years, quite the opposite), while exports as a share of German exports actually went DOWN. Make of that what you will, but it is another interesting data point for anyone who really wants to get to the heart of Spain's current problems. On the other hand, with exports now back near their previous peak, capacity levels must be getting strained, so Spain's export sector should be in need of increasing investment in capital goods, shouldn't it?As can be seen in the following chart, investment in machinery and equipment in Spain was rising steadily as exports rose in the pre-crisis period. Then the rate of investment fell by nearly 40%, and since that time the level HAS HARDLY MOVED. In Germany, on the other hand, we see the same pre-crisis pattern, and then the slump, but in contrast to the Spanish case, investment took off again as exports started to pick up. Germany is increasing capacity, while Spain isn't, doesn't that tell us something about competitiveness. It is one thing to get export prices more or less right using an old capital stock, and relatively cheaper workers (under the new contracts), and quite another matter to buy new capital and start to increase export market shares. And as always, the proof of the matter is in the eating. If things were going well, and Spanish exports really were doing as well as German ones, how come one economy is booming and the other flirting constantly with recession? Enough of misleading casuistical arguments and more facing up to reality, please! Argument Number Six - Competitive disinflation is underway. 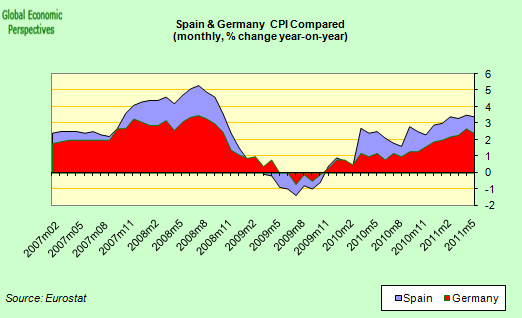 “Wage growth in Spain has slowed sharply, and is now running below euro-area average rates (and those of Germany)”. Obviously it depends what you mean by competitive disinflation. As Kluas Baader says, wage growth has slowed, and wages are now rising more slowly than Germany's are (but not by that much!). On the other hand, the general price level is once more consistently rising faster than Germany's is, and this in an economy which is hardly growing and in comparison with one which is booming. So the gains which are being made on wages are being lost in general inflation differentials. And Spanish industrial producer prices are also consistently rising faster than German ones, which gives us the strongest argument for much deeper structural reform that I can think of. Bottom line, as of the time of writing competitive disinflation is NOT underway. Argument Number Seven - Much of the economic weakness reflects rebalancing. “Weak domestic demand growth is not so much a sign that the economy is hopelessly uncompetitive, but rather reflects a necessary, and in the end healthy, rebalancing. This pertains especially to the construction sector, which must shrink from an unsustainably level. But the share of total construction investment in GDP down from a peak of 18% to 12% in just three years. Hence, most of the adjustment has already taken place”. Weak domestic demand growth is a reflection of significant over-indebtedness, a shortage of credit (even for solvent activities) , and the weight of a massive debt overhang. Uncompetitiveness comes in, as we have seen above, when you need to get export driven growth following the collapse in domestic demand produced by the over indebtedness. But what rebalancing is taking place here? One section of the economy, the construction one, has shrunk massively, with the result that unemployment has risen to 20.7%. But, as seen above, investment in new sectors is NOT taking place, so, there is no re-balancing at this point (unless, again, one insists on being causuistical) , and if anything the economy is even more lop-sided, since rather than balance there is simply a huge hole letting in water, rather like a battleship which has just seen an exocet tear through it just above the waterline. Just how unbalanced is the Spanish economy? Well look at the size of outstanding developer loans shown in the chart below, something like 320 billion euros of them. These represent houses that are either unsold, unfinished, or even as yet unstarted. 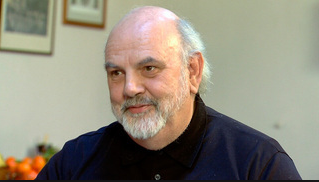 The Spanish economist Ricardo Vergés, who is a housing market expert, has calculated that Spain may have a potential excess of 2.3 million housing units. 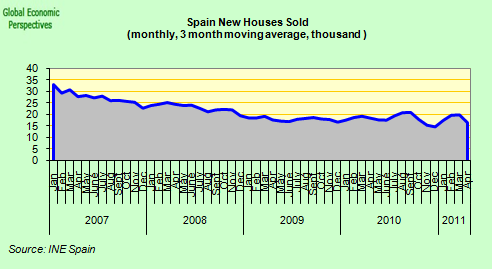 Vergés, who used to advise the now defunct Ministry of Housing on housing market statistics, arrived at this staggering number by calculating the difference between housing starts and final house sales over to reach a figure for the unsold (or as yet unbuilt) new homes (including homes still under construction or abandoned unfinished). Subtracting registered sales since Q1 2004 of 2.45 million from housing starts since Q3 2004 of 4.77m, Vergés comes up with his figure of 2.3 million housing starts that have yet to end in sales. It is estimated that roughly 1 million of these houses have been completed, thus there may something like 1.3 million more waiting to be finished, and hence the large mass of developer loans outstanding. Naturally, to complete these houses the banks will need to provide yet more credit to developers, making it even more difficult to fund new profitable businesses even as credit in general is reined-in in a bid to meet the new (higher) core capital requirements. To get an idea just how difficult it would be to shift all these developer loans and turn them into sales, a contrast with the existing stock of mortgages (after all the boom years) is instructive. 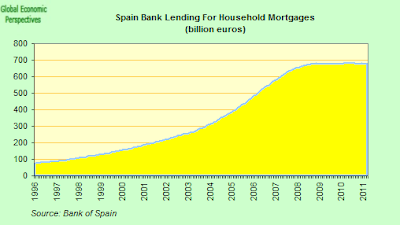 At the present time the Spanish banking system is financing just short of 700 billion euros in mortgages. To accomodate all the latent needs of the housing sector this number would need to go up by something like another 50%, and in a period of "rebalanced" economic activity. The argument staggeringly fails to convince. Argument Number Eight Private sector debt is high but correcting. “Spanish household debt is high at 120% of disposable income (same as UK, lower than Netherlands, Ireland or Sweden, but above the 82% euro area average). But the deleveraging of the household sector has begun: the household savings rate soared from 10.3% of disposable income in 2007 to 17.7% in 2009 (it has since eased back to 13.0%). Credit growth has come to a complete halt”. 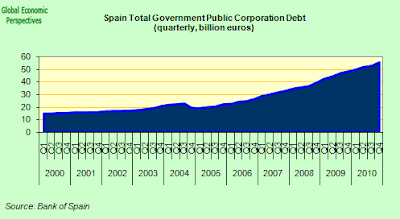 Firstly we need to be clear, household debt is not the sum total of all private sector debt in Spain, there is also corporate debt to think about. The combined total is something like 220% of GDP (90% for household debt and 130% for corporate debt). Some deleveraging is going on, but it should be remembered that government debt is now increasing, so the total indebtedness of the economy isn't changing much. On the other hand, as Klaus Baader says, credit growth has come to a "complete halt". Indeed it is even contracting. In April the total stock of corporate loans was down 0.1% over a year earlier. While the stock of household loans was down 0.1%. Is this a good thing? Well it is and it isn't. It is positive in the sense that the private sector is timidly deleveraging, but it is also systematic of the fact that there is a strong credit crunch taking place, and that new initiatives (that could help rebalance) are finding it extremely hard to get credit. Basically the banking system isn't on the point of implosion, and it isn't going to disappear tomorrow, but it is sufficiently badly affected that it is strangling the real economy, and that is one of the main reasons a recovery isn't coming. 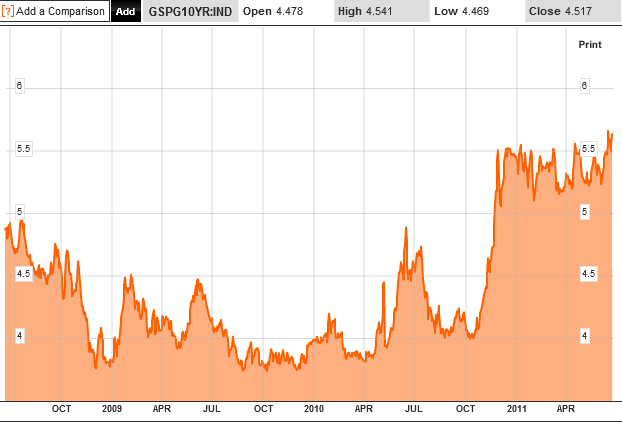 Argument Number Nine - Spain is not being crushed by market interest rates. “Unlike Greece, Ireland and Portugal, Spain is not being crushed by unsustainable refinancing costs for its public sector debt”. Well...... This is not the best moment to be asserting this Klaus! 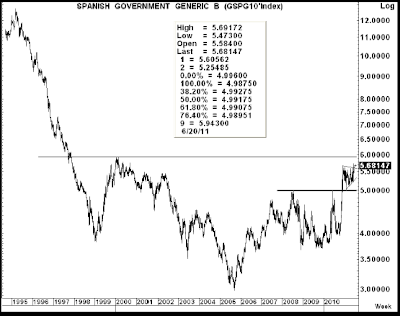 Certainly Spain's interest rates have not reached the horrific heights attained by their Eurozone neighbours, but they are also hardly rubbing shoulders with historic lows. Last week the spread of the Spanish ten year bond over the German bund equivalent hit a new Euro era high of 288 base points. More to the point, the 10 yr yield closed on Friday at 5.68%, for the first time going above November's previous high of 5.67%. 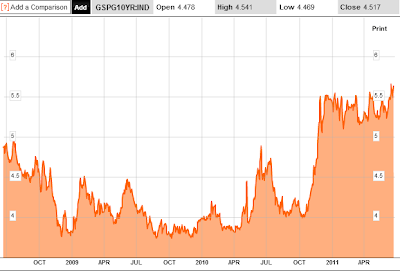 Obviously psychological thresholds now loom at 300 bps on the spread and 6% on the yield, and if the market breaks resistance on these there is a danger that they could move higher quite sharply, especially if the Greek situation deteriorates in any way, or if the ECB surprises markets by not moving rates in early July. Not exactly the best of environments for a critical Bankia IPO. 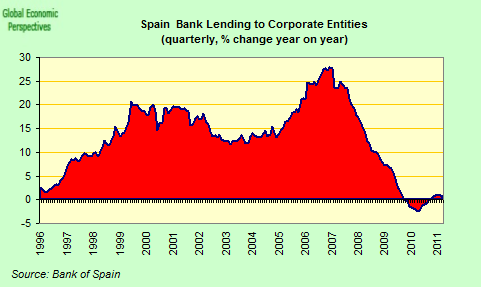 As I said above, since April the Spanish banks have been returning to the ECB funding fold in increasing numbers, for the first time since Spain managed to "decouple" after the Eurozone crisis of May/June 2010. Again, a sign that the decoupling may now not be holding. This post first appeared on my Roubini Global Econmonitor Blog "Don't Shoot The Messenger". India's Economy Hits What Has To Be A Very Welcome "Soft Patch"
As the European Central Bank moves steadily and earnestly forward with its ongoing rate hike cycle - in so doing sending one fragile economy after another along Europe's periphery drifting off towards recession - there is at least one prominent global central banker who must be feeling vindicated in the policy stance he has taken to try and bring the rampant inflation from which his country has been suffering back under control. 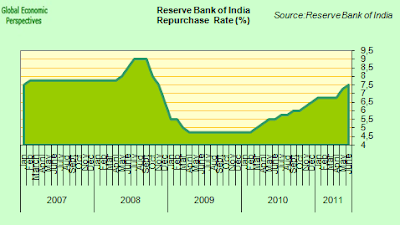 Duvvuri Subbarao is Governor of the Reserve Bank of India, and under his stewardship the central bank has been hard at work over the last twelve months trying to credibly fight inflation. 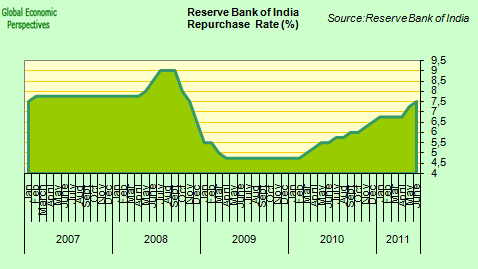 So far raised rates have been raised ten times, and the bank has managed to claw the annual rate of wholesale price inflation back from its peak of 10.9% to the current level of 9.06%. Hardly a level to be complacent about, but then Mr Subarrao seems far from complacent. Obviously there is long way to go yet awhile before he can even reach his short term inflation target, which is why he warned again following last week's monetary policy meeting - when the benchmark repo rate was raised to 7.5% - that monetary tightening in India would continue even at the cost of further slowing economic growth. In so doing he underlined his determination to reach his inflation objective of 6 percent “with an upward bias” by March 31, 2012 and maintain the credibility of the bank as an independent entity. So, be warned, when this man says "strong vigilance" he means it, even though, as has to be recognised, central bank rates are still negative at this point. As a result of this posture India’s economy may, he accepted, expand by only “around 8 percent” in the financial year through March, a reduction on the 8.6 percent he previously estimated, and significantly short of those double digit growth rates India must be aiming for in the near term. In fact most forecasters agree with Subarrao, and see India's growth dropping back from last years sweltering 10.3% pace, indeed the majority of commentators are agreed that in the very short term this would be no bad thing. 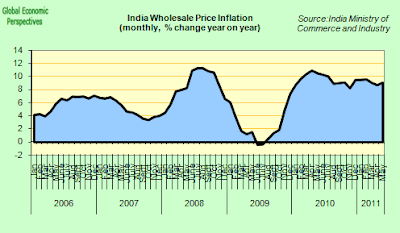 India's inflation is structural, and needs containing so the economy can accelerate to its full growth potential, which I personally estimate to be well into the double digit zone. 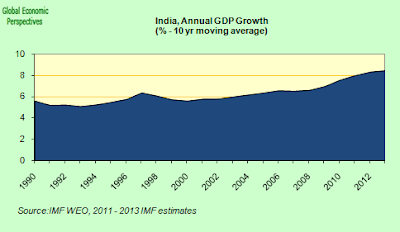 I have felt and been arguing so for some years (see me berating the Economist on this very topic of India's growth potential here in 2007 and here in 2006). 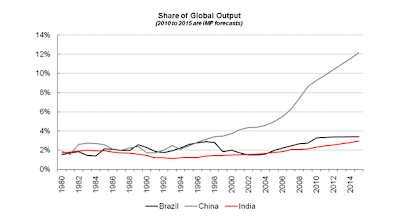 It is highly likely India can easily fact break all those earlier Chinese records when she really gets going, such is the country's potential, but that potential can only be realised if the old phantoms which haunt the economy are hunted down and eliminated. High on the "hit list" here has to be the inflation curse. Purging the endemic inflation out of the system is as much an attitude change as anything, and Duvurri Subbarao is hard at work trying to achieve it. People need to get used to the idea that they cannot simply solve their short term problems by raising prices and passing on their inefficiencies to customers, and that the reason they can't do this is that the central bank is there to make sure they don't. As I say, India’s current inflation problem is largely a structural one, and is in large part due to supply side rigidities coupled with low capacity slack in some of the key sectors. Ultimately only government initiated reforms and substantial infrstructural investment can get to the heart of the problem, but the central bank has a key role to play in this, especially by demonstrating to would be investors that the financial and price environment is a stable one. The current bout of energy and food price inflation is a particular concern given the risks that the country's supply side deficiencies and rigidities could generate second round effects and feedback into core prices. This is important, since unlike in many developed economies, India’s inflation is, in part, a demand-driven phenomenon. And since it is demand driven, it is susceptible to the application of monetary policy. In any event, more interest rate rises are certainly in the pipeline, and the markets are taking the central bank growth warnings seriously: stocks peaked in November, and they show no sign of reviving in the short term. Now, if we take a look at the way things worked out in the first decade of the present century, you might want to ask yourself how I can be so sure that India is destined to become one of the leading players in the global economy over the next decade or two. 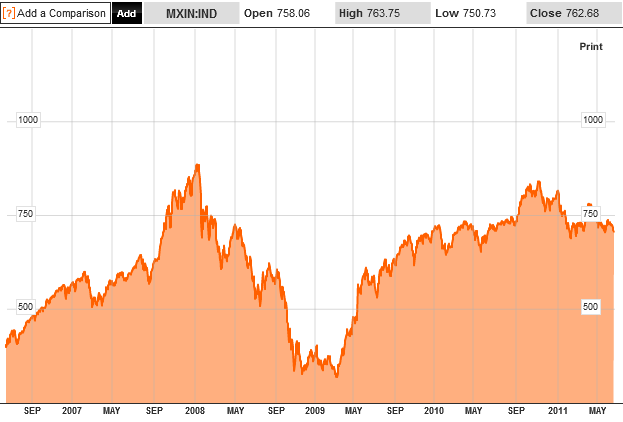 Surely up to now the Emerging Markets story has been very much a China one. Well my answer would be, it's the demography silly! Now I am sure there will be no shortage of people lining up out there just waiting to tell me that I am wrong, that demography isn't destiny, and I don't know what else. So I am here to answer them, saying you are right, in economic terms demography may well not be everything, but it sure as hell is a big part of the picture, a much bigger one than many economists are willing to admit. This is the real problem, since mainstream neo-classical economics and structural-reform-oriented microeconomic analysis virtually screens demographic dynamics out of the picture. 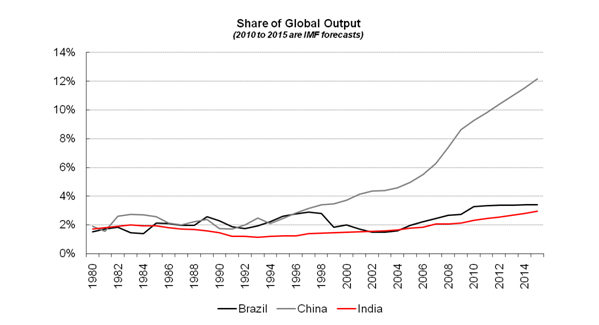 And it is the underlying comparative demography of the two huge emerging "mega-countries" that suggests to me that while the global growth story at the present time is largely a China one, poll position could easily pass over to India at some point during the next decade. The principal reason I feel so confident in saying this is that India's demographic transition is a much more balanced one, producing a far more stable population pyramid than the one China is about to find itself landed with. Population ageing is a global phenomenon, one which has been affecting all societies and all countries since the start of the industrial revolution. 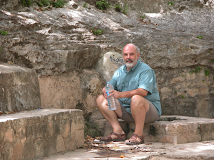 The last 250 years have seen enormous and swift changes in the structure of our populations. During nearly roughly 10,000 years prior to the coming of modern society population median ages and structures varied very little, but since the the end of the 18th century, and driven by movements in fertility rates and life expectancy, populations all across the globe have been steadily ageing. Put very simply this ageing comes in two waves, which could loosely be called the first and second demographic transitions. During the first transition fertility falls from very high levels to population replacement ones, the proportion of those in the working age groups rises constantly, while life expectancy increases such that the population in the 65 to 80 age group steadily increases. This is the time when pension Pay As You Go pension systems are introduced, since people still can believe they are sustainable. During the second transition, fertility in many countries falls well below replacement level and stays there for several decades. Life expectancy rises such that the over 80 population becomes a significant part of the total population and the working age population goes into long-term permanent decline in both absolute terms and as a proportion of the total. As this happens, people start to worry about the sustainability of those very same pension systems they have just introduced, while financial markets begin to ask questions about the posibility of sovereign default. Again simplifying, the developed societies are now well into the second ageing phase, while the so called emerging (or "growth" economies) are at some point or other along the first one. And the the big difference between India and China is the velocity with which they are passing through the first phase. Back in the 1970s China opted for a short term solution to its perceived population problem by applying drastic social surgery in the form of the one child per family policy. 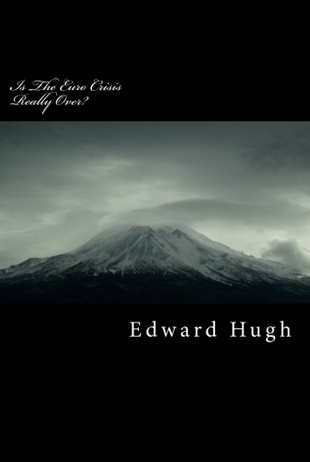 Their problem was, of course, a very real one, since the underlying population explosion made it very hard to feed everyone, but as is often the case with such drastic remedies, in the longer run the cure may turn out to have been even worse than the ailment. 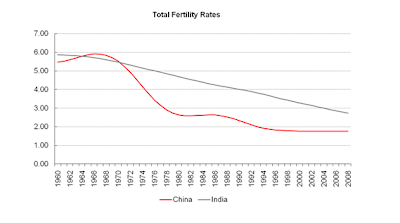 Fertility in India, on the other hand, has declined much more slowly (always accepting, naturally, that there are very large differences between North and South) and as a consequence the poulation ageing process is much slower. While the proportion of population in the under 14 age group declined from 41 per cent in 1961 to 35.3 per cent in 2001 (that is, by 5.7 percentage points), the proportion of population in the age group 15-59 increased from 53.3 per cent to 56.9 per cent (that is, by 3.6 percentage points). The proportion of those over 60 increased from 5.6 per cent to 7.4 per cent (that is, by 1.8 percentage points). In strictly numerical terms the changes seem much larger. 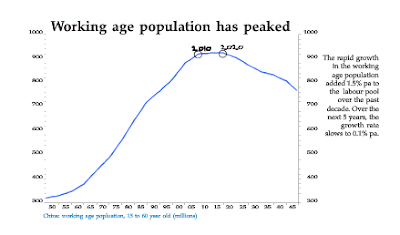 The increase in the 15-34 age-group population, for example; has been quite dramatic: from 174.26 million (31.79 per cent) in 1970 to 354.15 million (34.43 per cent) in 2000. This age group is currently projected to peak in 2030 at around 485 million. 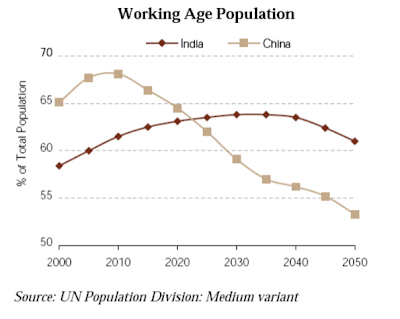 According to UN Population Division projections even though the 15-34 age group will only start to decline in absolute terms in India post 2030, it started to fall as a proportion to the total population last year. But for the time being the rate of decline is marginal (being projected to drop from 35.4 per cent in 2010 to 34.5 per cent in 2020, to 32.4 per cent in 2030). After 2030, however, the rate of decline will accelerate (dropping to 29.7 per cent in 2040, and 26.6 per cent in 2050 according to the forecasts). Yet even given this there will still be a massive 441.1 million people in the age group by the time we reach 2050. This demographic evolution will have important implications for the country's labour market. India's labour force, which was estimated at 472 million in 2006, is expected rise to around 526 million in 2011 and then grow steadily hitting 653 million in 2031. The labour force growth rate will remain higher than the rate of increase in total population until 2021. 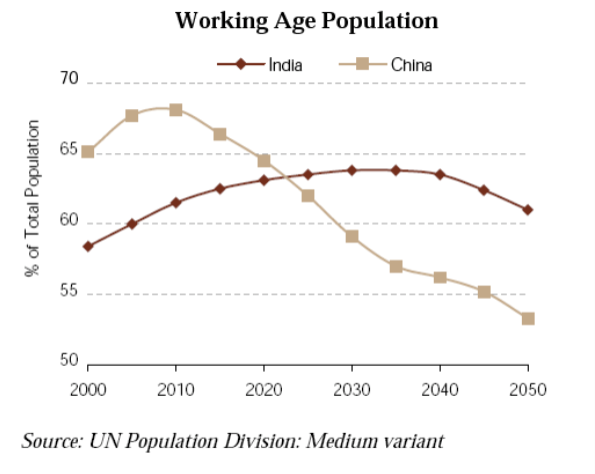 According to Indian government estimates, 300 million young people will enter the labour force between now and 2025, by which time approximately 25 per cent of the global labour force (or one worker in four) will be Indian. Meanwhile, as can be seen in the accompanying charts, China's working age population is in the process of peaking both numerically and as a proportion of the total population. China is getting old far too fast. By 2040, assuming current demographic trends continue, there will be 397 million Chinese over 65 - more than the total current population of France, Germany, Italy, Japan, and the United Kingdom combined. 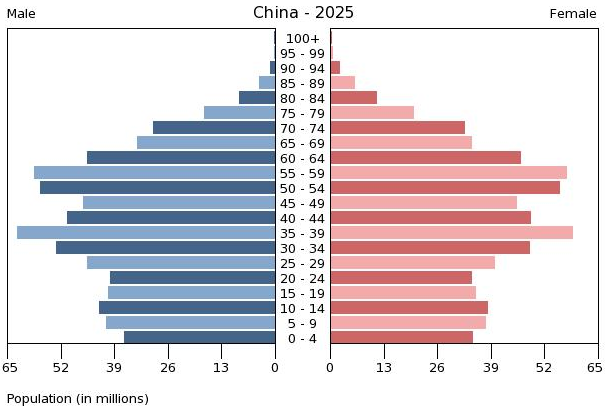 The population pyramid is shifting fast (unusually fast for a country with China's income level), and the degree of ageing we should anticipate, in terms of both absolute numbers and velocity, is simply staggering. It is during the 2020’s that China’s age wave will arrive in full force. The elder share of China’s population seems set to rise steadily from 11 percent of the total in 2004 to 15 percent in 2015, and then leap to 24 percent in 2030 and 28 percent in 2040. Over the same period, China’s median age will climb from 32 to 44. Thus China’s ageing is characterised by the unusual speed with which it is occurring, something which should not surprise us given that the outcome is the result of a massive social engineering experiment. To give an idea, while Europe's over 65 population crossed the 10 percent threshold back in the 1930s, it is not expected to reach the 30 percent of the population mark until the 2030s, a full century later. China, on the other hand, will traverse this same distance in a single generation. The magnitude of China’s coming age wave, is simply staggering. 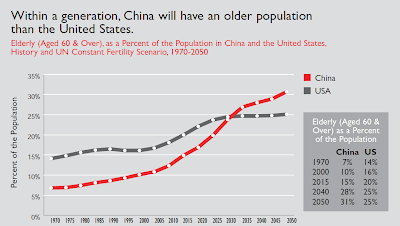 And if the economic consequences of the first (positive) part of China's demographic transition have already been large and significant, we should now be beginning to brace ourselves for the other part, the demographic downside. So India has huge potential, including the potential to act as a sheet anchor for a global economy in a state of shock as China struggles with the enormous challenges which will face it. But will India really be able to realise the potential it has? To think about this. let's go back to the short term economic development of the Indian economy, and back to the world of Duvarri Subarrao and the battle he is fighting over at the Indian central bank. 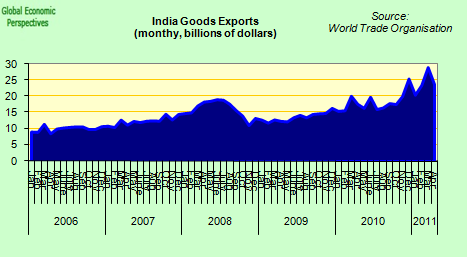 Now first of all the good news: India's merchandise exports rose sharply in May, helped by a surge in shipments of engineering and electronic products. They jumped 56.9% year-on-year to reach $25.9 billion, and totalled $49.8 billion for the first two months of the fiscal year that started on April 1, an increase in 45.3% over the same period a year earlier. So here we have the first sign beyond the inflation that all is not entirely well in the Indian economy. 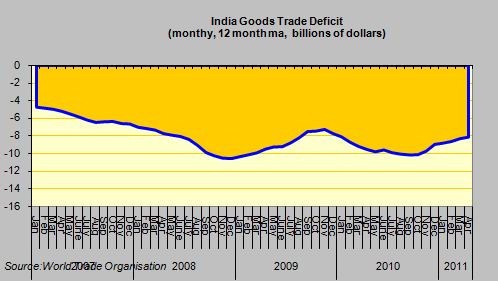 If India has a trade deficit, then this means that someone somewhere is borrowing money. And indeed they are, since while private sector indebtedness in India is low (despite rising consumer credit), government debt is high, indeed it is very high by emerging economy standards. But when you have an economy expanding at 8% a year, and set to accelerate to over 10%, so much government debt is hard to understand, especially since all the evidence suggests that it is not being used to finance a massive, and much needed, infrastructure overhaul. 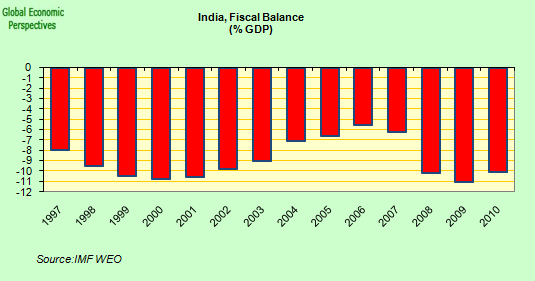 And at the present time India's general government deficit is running at near to 10% of GDP. Part of the problem here are India's state governments, but even the performance of central government leaves a lot to be desired. Finance Minister Pranab Mukherjee has promised to marginally reduce the central government budget component to 4.6 percent of GDP in the current financial year, down from 4.7 percent in the previous 12 months, but even this minor correction now seems to be in some doubt, since Chakravarthy Rangarajan, chairman of the Prime Minister’s Economic Advisory Council, told reporters in Mumbai recently that the target would be “difficult to achieve". 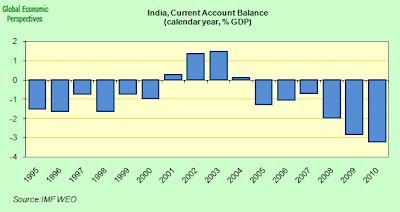 With a fiscal and a trade deficit it is hardly suprising that India's current account position has been deteriorating in recent years. 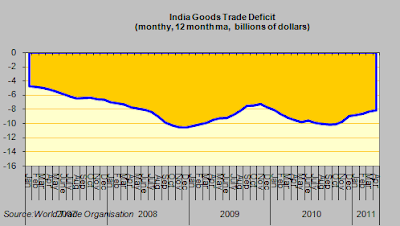 India reported a current account deficit equivalent to $9.7 Billion in the fourth quarter of 2010, down from $16.8 billion in the third quarter, and the situation may have even improved again during the first quarter given the strong export performance, but the IMF are still forecasting a small increase for 2011, up to 3.7% of GDP from 3.2% in 2010. At the present time the deficit is being financed by short term capital inflows - India's reserves stood at $313 billion at the start of June, up from $271 billion a year earlier (a rise of 15%). Net private capital inflows to emerging market economies can be expected to keep growing this year (provided there is no financial accident in Europe) and could even reach $1.1 trillion in 2012 according to a recent estimate by the Washington-based Institute of International Finance. As the IIF says, “The strength of capital flows is still presenting policy challenges in a number of emerging economies, especially those already facing pressures from rising inflation, strong credit and asset price growth and rising exchange rates" - India's case precisely. Just as importantly, many of the inflows are short term, and are primarily used to fund bank loans and equity purchases. The share going into infrastructural and other projects is comparatively small.The Bank For International Settlements (the central bank of the central banks) highlighted just this problem in their latest quarterly report, drawing attention to the extent to which the rapid growth in lending to emerging market economies might be “hot” money, subject to withdrawal at short notice. According to the bank, most of the growth in lending to EMs between the second quarter of 2009 and the end of 2010 was driven by short term lending, and an estimated $418bn, or 79 per cent, of the increase consists of loans with maturities of less than one year. This compares with the 49 per cent of lending to EMs falling into this category between the start of 2006 and the middle of 2008. And the bank also highlighted just how the trend of increasing reliance on short-term lending was highly concentrated among borrowers in the Asia-Pacific region which accounted for 84percent of the recent rise. These proportions look horribly like what we were seeing entering emerging economies in Eastern Europe in the run up to the Lehman debacle, which means if we do have a sharp reversal in risk sentiment on the back of the Eurozone debt crisis, emerging Asia would look to be very exposed, a point which is not lost on central banker Subbarao, who warned on precisely this topic in a recent speech in Zurich. After the U.S. announced its second round of quantitative easing in August 2010, “the prospect of easy liquidity in the U.S. seemed to prompt a large increase in capital flows to emerging market economies, threatening domestic price and financial stability,” he told his audience. Since the U.S. quantitative easing policy had also put pressure on global commodity prices, the "combination has put some emerging market economies in a policy bind, but higher interest rates will only intensify capital inflows, potentially putting more pressure on exchange rates and domestic stability. In India’s case, the concerns on this account currently are less acute since capital flows are needed to finance our current-account deficit.Yet even for us, the composition of the inflows remains an issue,” he said. “About three-quarters of the current-account deficit has been financed by volatile capital inflows.” And those inflows, in situations of stress could easily reverse, as he knows only too well. Having said all this we should never forget that India is still an emerging economy, one which has made great strides forward in recent years. And despite many difficulties India has remained a democracy since independence. It is a country where human rights are by and large respected, and where institutional quality is gradually improving. As I am suggesting here, the central bank is becoming more and more independent. Corruption is still a BIG problem, but eventually this has solutions. At the same time India is a country of individuals, of creativity and strong entrepreneurial spririt and, to close with a professional bias: India produces economists of extraordinary quality. And, as I said above, maybe demography isn't everything, but we should never forget that it is a large and important part of the picture.